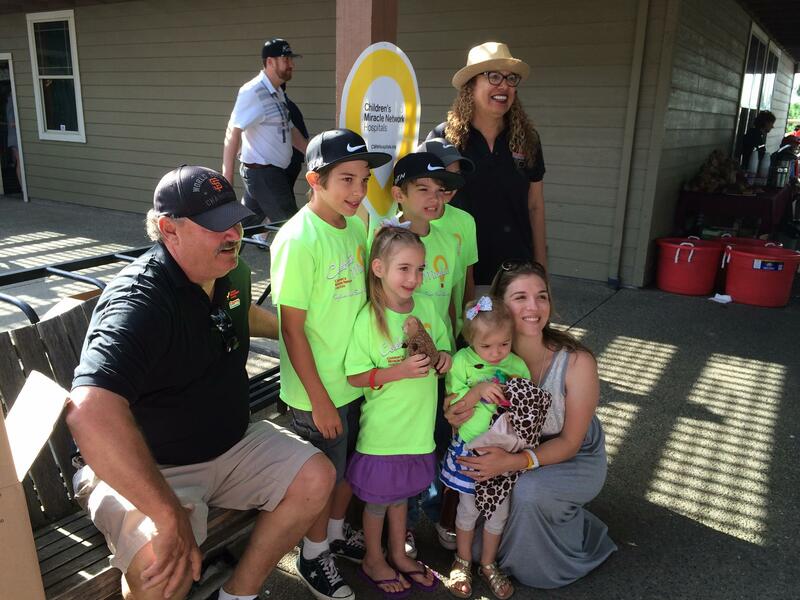 We’ve mentioned our involvement with CMN (over and over and over and over and over and over again), and also how we’ve been able to share our story with Costco, one of CMN’s greatest supporters. We love the people of Costco. They are kind, compassionate, generous, and supportive, and they’ve showered us with their affection more than once in the last couple of years. In March of this year the kids and I had the opportunity to share our story with the regional Costco managers again, and afterward, some of them came up to thank us. 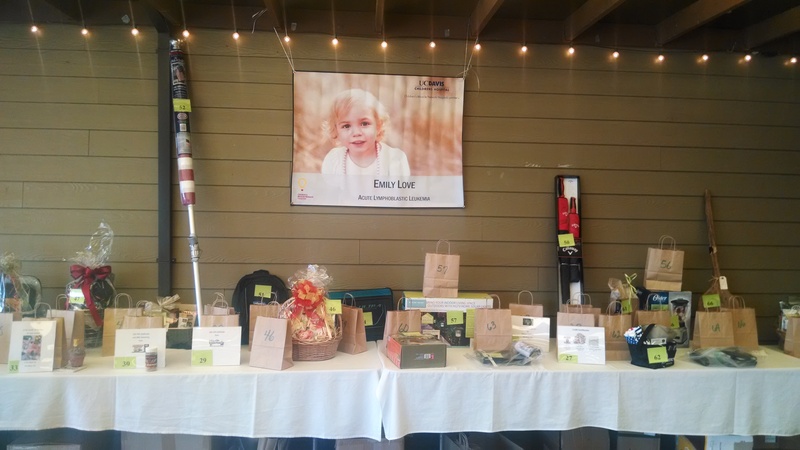 One of them was a cancer survivor and Costco Depot manager, who invited us to share Emily’s story and Beads of Courage at their 2nd annual CMN/Costco Golf Tournament. Of course, we were delighted to be involved! So on Saturday, May 3rd, we headed down to Lockeford for the tournament, which was hosted by the Costco Depot and attended by Costco employees and vendors. Every single person we met was smiling and laughing and happy to see us. After everyone was registered, they all gathered for a group photo, inviting us to join. Then they introduced us and we briefly shared our story. We brought Emily’s Beads of Courage, and the kids held them up as I talked. 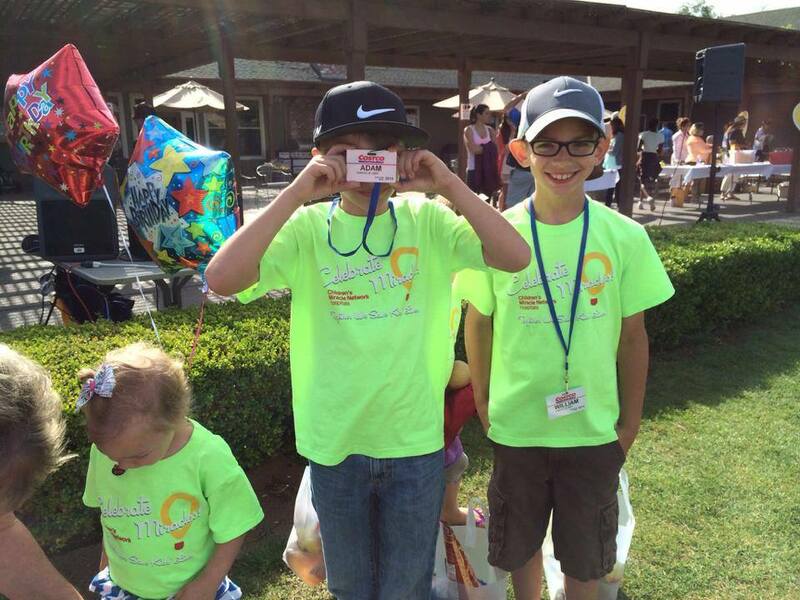 Mostly we wanted to thank them for their commitment to CMN. 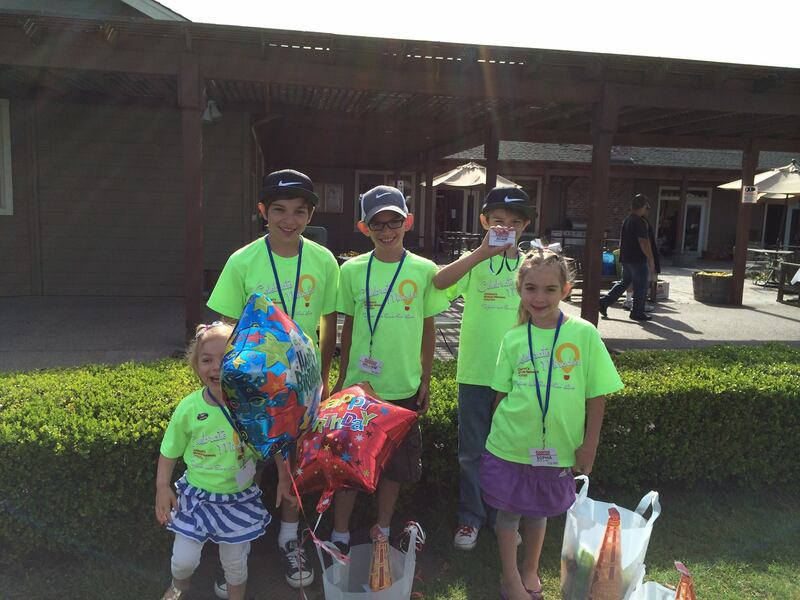 Costco has been a HUGE supporter of CMN for many years -you’re probably seeing the yellow and red CMN balloons at your local Costco now (May is their big drive month). 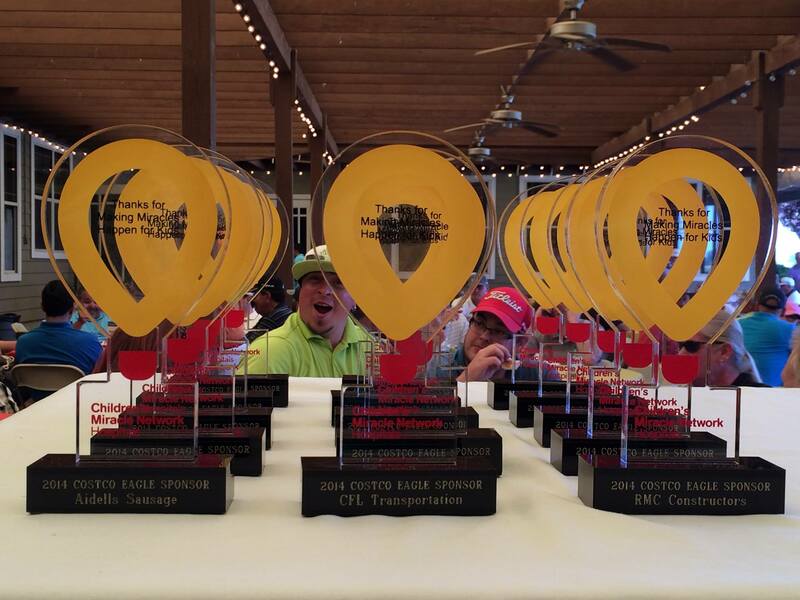 However, in addition to the balloon sales at their warehouses, the Depot began this annual golf tournament -all on their own -and last year they raised $34,000. I haven’t heard the numbers for this year, but I’m sure it was more. 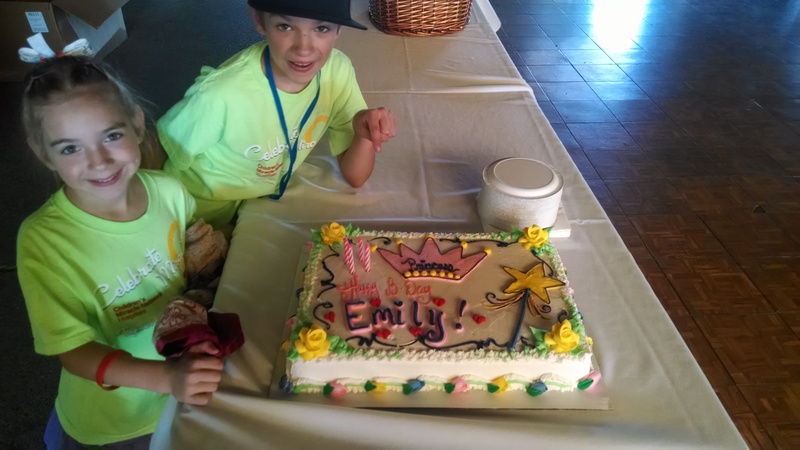 After we spoke, they surprised us by bringing out a birthday cake for Emily while they sang Happy Birthday. They also brought out goody bags for each of the children -and you can imagine how big and full the goody bags were, being from Costco! All the kids also received their very own Costco Employee lanyards! Those were a hit 🙂 The rest of the day was spent enjoying the sweet people, good food, and golf. We all had a blast and are so thankful we got to spend time with such amazing, warmhearted people. One of the raffle prize tables. 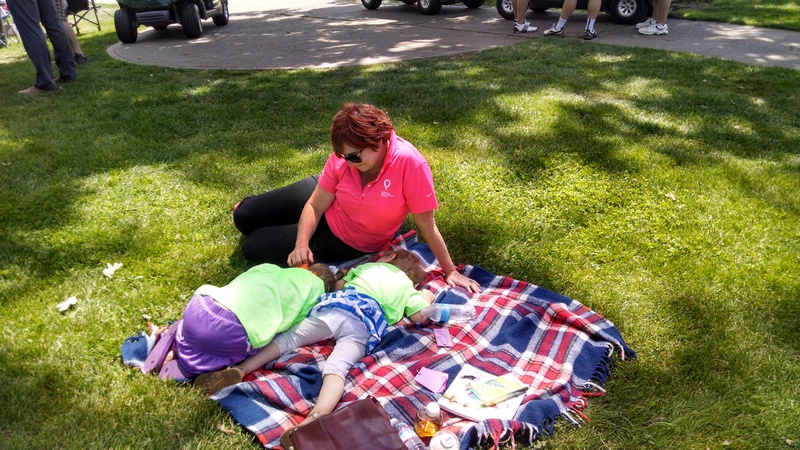 CMN Director, Jacqueline Mills, is the most amazing woman. 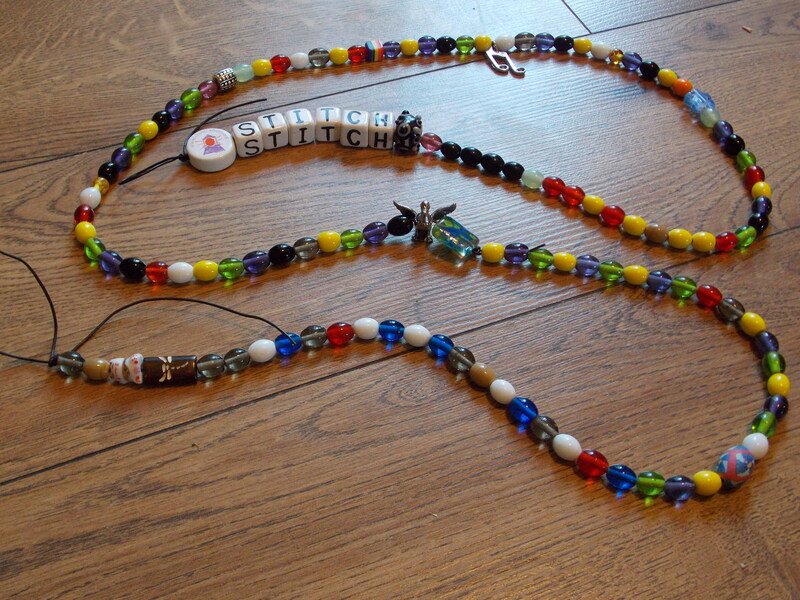 It’s been over a year since we’ve shared Emily’s Beads of Courage, so here they are! A year ago Emily and I were able to travel to the Northern California Costco Regional Managers meeting to share her story. They do their big fundraiser for the Children’s Miracle Network every May, so we got to help pump the managers up, so they could in turn pump their employees up, so they could in turn sell more of those red and yellow CMN balloons 🙂 All of the proceeds of those balloon sales go to CMN and (here in our area) to the UC Davis Children’s Hospital. The funds pay for things the hospital can’t afford, such as specialized equipment, research, the Child Life program, and the Beads of Courage (plus more). Just yesterday, all five kids and I got to speak to the same Costco managers and share an update. They were so sweet to have us, and we were so honored to be able to help give back. We brought her beads, so they could see how important their efforts are to families like ours. I forgot to include something for a size reference in the photo above, but those beads stretch clear across a large conference room. I am so thankful for such a neat program available to Emily! Hello! This is Chrissie, Emily’s Mommy, writing here for the first time. Now that Emily is in the Maintenance Phase, I finally feel able to breath, and I hope to write a post here and there to keep everyone updated on how Emily -and the rest of our family -is doing. I won’t write a lot today, but I want to share a brief update on Emily’s Beads of Courage. As my sister, Elisabeth, explained earlier this year, the Beads of Courage program is a beautiful way to keep track of Emily’s journey through leukemia. She is blessedly young enough to not remember most of what she is enduring, so I especially appreciate the beads for the story they will one day tell her. 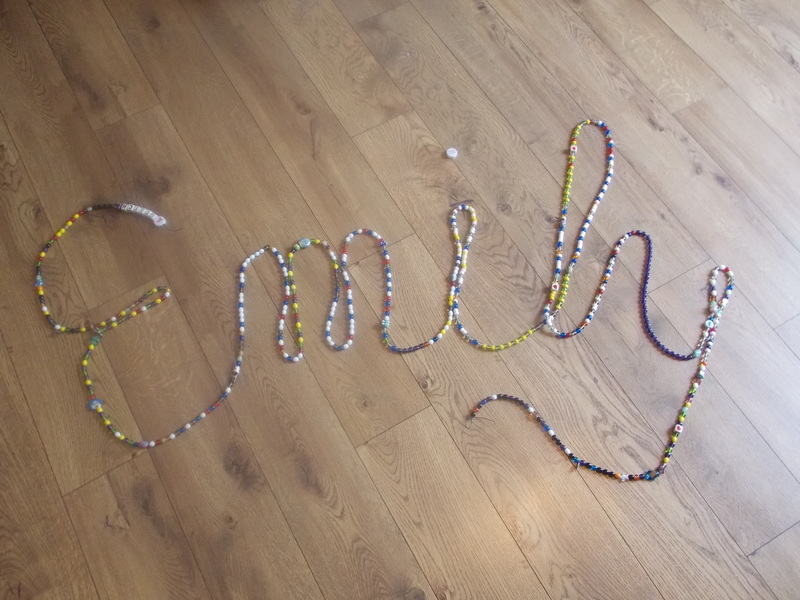 Emily has collected nearly 500 beads this year, all signifying an important part of her journey. Some of the beads were gifts from beautiful friends (the dragonfly and cat), some were given as Beads of Courage from brave people who carried them in their own races (the blue/green glass bead) or from organizations that recognize Emily’s bravery (the duck bead), and most of the others describe parts of her treatment and obstacles she’s overcome. The white beads denote chemotherapy treatments, red is for blood and platelet transfusions (34), beige for bone marrow biopsies/aspirations (3), tortoise/orange is for spinal taps (13 so far), blue are clinc and infusion room visits, yellow signify overnight stays in the hospital (ten this year), green is for fever and neutropenia, purple for antibiotics, and the little grey ones show how often her Broviac dressing is changed (too many times). You’ll also notice some larger, more colorful beads. Two of them represent her allergic reactions to the Aspariginaise chemo this summer, the really big one in the middle represents the day she began walking again, and the smaller green one next to it shows that she spent her birthday in the hospital. The face bead is an obvious one -it signifies when she began losing her hair. Speaking of hair, Emily’s is growing back!! We love her bald, but we cannot wait to see her hair again! It’s coming back in light blonde, but will it still be curly?? Can’t wait to see! Emily’s new phase of treatment has kept her quite busy. It has kept everyone busy! But while we are all tracking her journey by blood counts and number of appointments, Emily is keeping track with her beads of courage. Emily’s beads are a marker of every procedure and milestone she undergoes throughout her treatment. They are a reminder of everything she has survived and the courage she has as she continues to fight. Christina keeps track of every chemo treatment, every needle poke, every x-ray, biopsy, and infusion so that Emily can get the beads she deserves. Her strand is continuing to grow, and is already much longer than the picture below shows. It grows so fast, it’s difficult to keep up! Many people have expressed being moved by the beads of courage after our first post. The beads are, rightly so, becoming a symbol of courage for many of us. Emily is just ten days away from her 2nd birthday and already she has demonstrated a strength of body and spirit that is encouraging for all the adults around her. Friends and strangers are using Emily’s beads to share their own stories, to give support, and to remind us all to keep Emily in our prayers. At the end of her strand of beads above are two new special beads. The first, a dragonfly, was given to Emily by a family friend, Marlene. The dragonfly means “believe” and reminds us all to believe in the 100% cure we are praying for daily. Some of those friends, students of a family friend, created their own strand of beads in Emily’s honor. 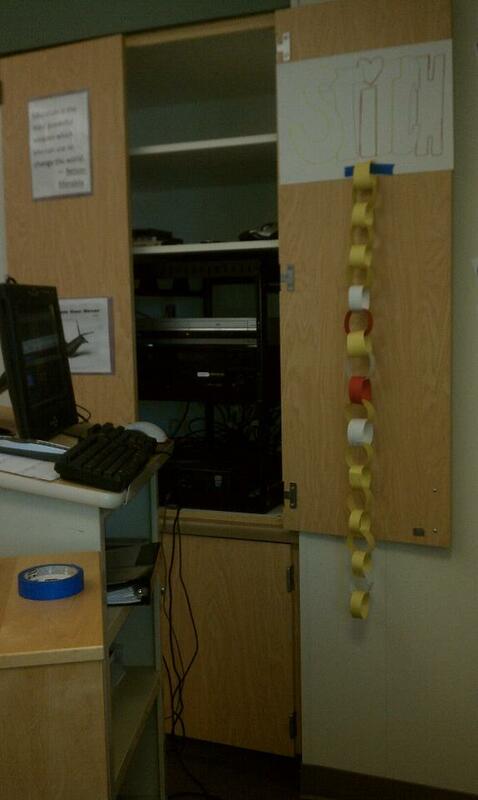 Displayed in their classroom, these paper beads are a reminder for all the students to keep Emily in their prayers. 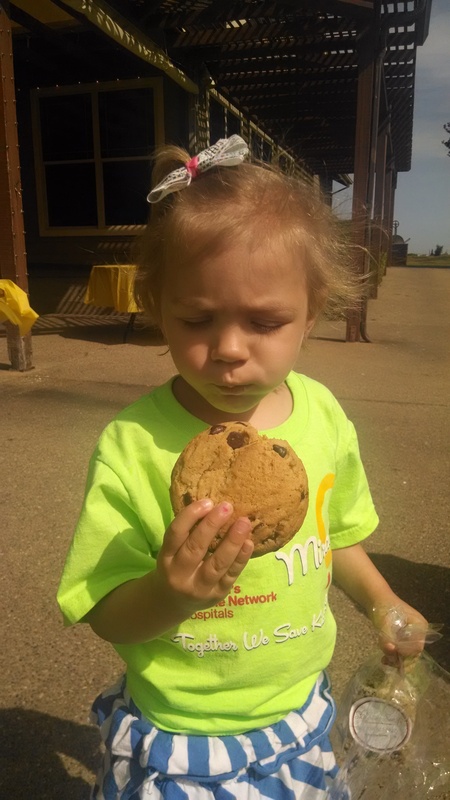 Emily’s Consolidation treatment has continued with a heavy stream of chemotherapy drugs and frequent trips to the hospital. Her blood counts have dropped, making her neutropenic, and a recent call from the doctor has raised concerns that something in her labs is not quite right. In the midst of this chaos and uncertainty, Emily has had good days. After whole blood and platelet transfusions yesterday, Emily had full color in her cheeks and was mobile and playful in a way that reminds us all of the little Stitch she used to be before Leukemia became a reality of our lives. It is amazing how a little healthy blood can transform this sick child. As always, we share these happy times with all of you while asking you to keep Emily and her family in your prayers. As her beads symbolize, Emily is undergoing so much. But she is strong and spirited and in the arms of our Lord. We pray for a day her body can keep itself healthy and her smiles can warm our hearts every moment. Emily will go see her Oncologist on Monday to hear the results of recent lab work that we have been told was “not as expected”. Please pray this is not another setback and please pray the family has peace as they wait to receive the news. Please pray for Christina, that she gets rest and opportunities to relax. Please pray for a mother’s peace as she carries the heavy burden of wanting to protect her child and that she may trust in the Lord and the doctors to do everything they can to keep Emily safe. 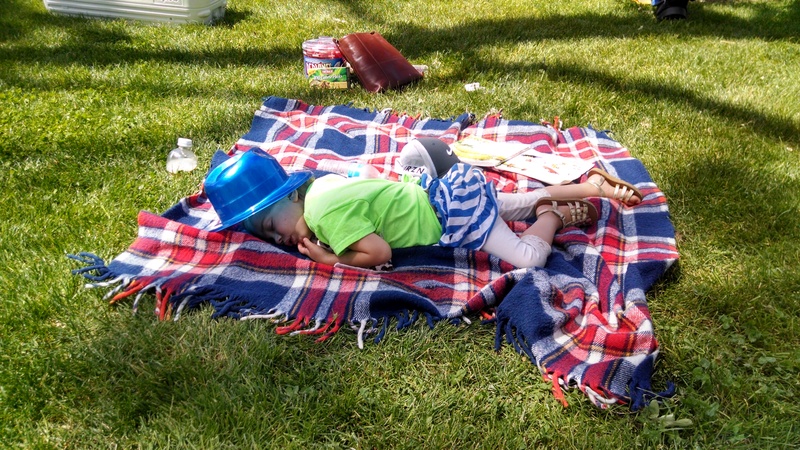 Please pray for Ethan, Adam, William, and Sophia – Emily’s older siblings. Pray that they continue to feel loved and safe and know how special they each are. 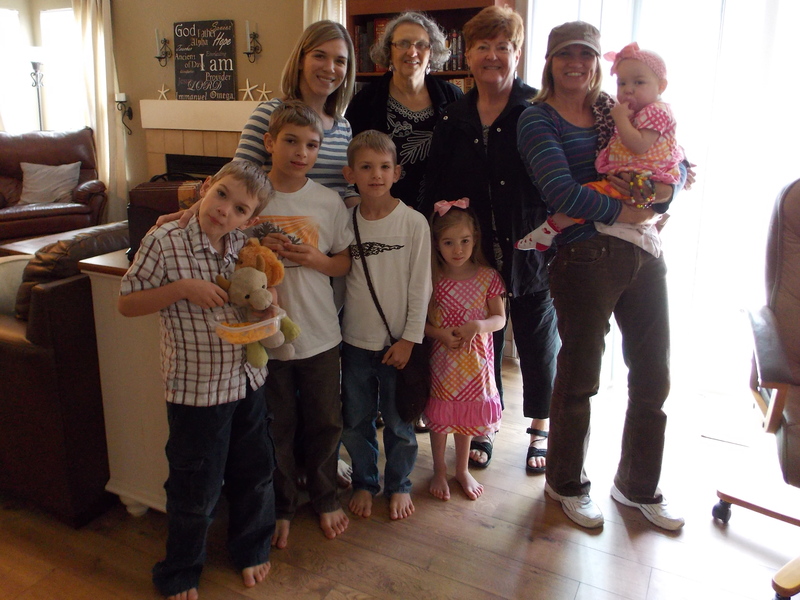 Pray for understanding as they live with Emily’s disease and all the changes it has brought to their lives. Pray that they also have strength and courage. They are all four little Warriors alongside their sister. In 2004, a pediatric oncology nurse, named Jean Baruch, was looking for a way to help children deal with the emotional effects of serious and life-threatening illnesses. 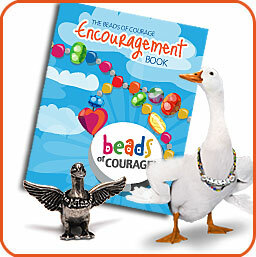 She developed a program called Beads of Courage. 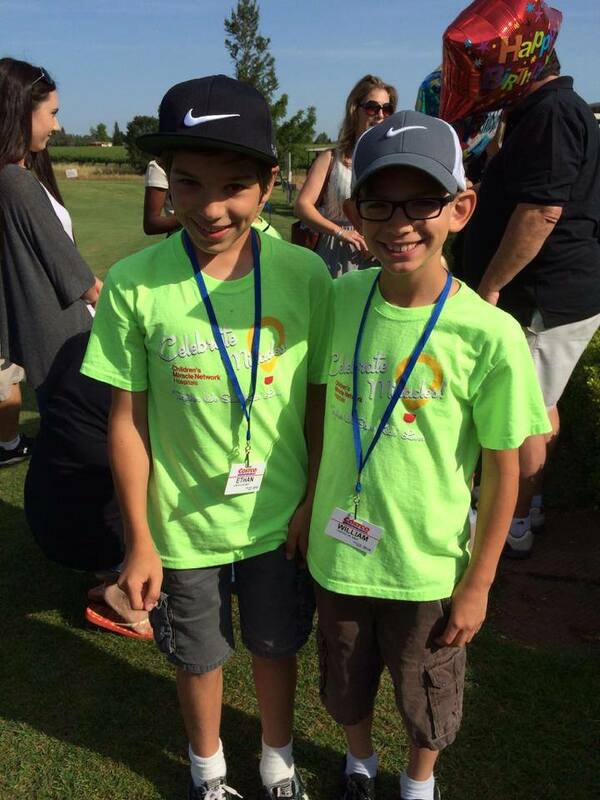 Begun in Arizona, the program now supports over 10,000 children in 60 hospitals around the world. 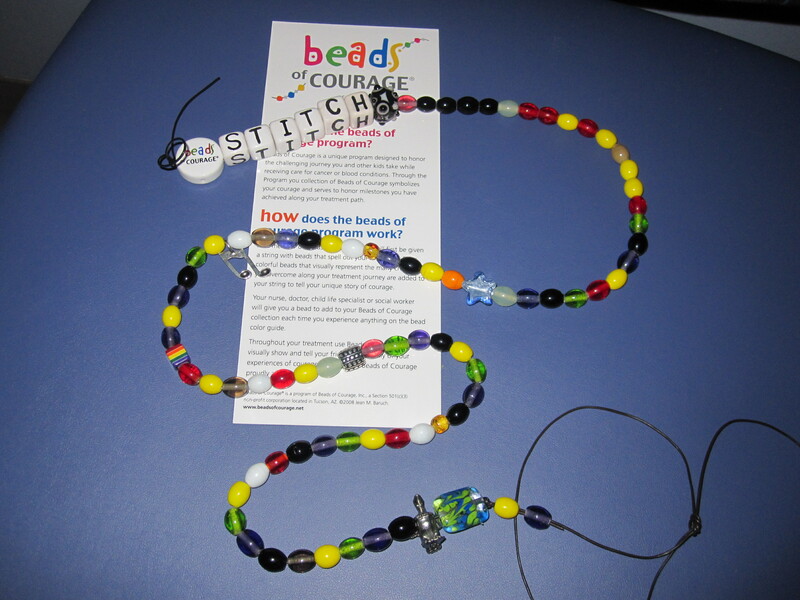 The mission of the Beads of Courage program is to use art as a way for children to track and celebrate their journey through illness and to provide a reminder to the child of what they have already overcome when facing a difficult procedure. For every step of a child’s medical journey, from an x-ray to a radiation treatment, they receive a color-coded bead to add to their string. Children often amass 10 to 35 feet of beads! And through their strand of beads, they can tell the story of their courage on the road to recovery. The Child Life Specialist at U.C. Davis introduced Emily to the Beads of Courage program and over the past four weeks, Emily has begun collecting her own strand of beads, representing every blood draw, surgery, and night in the hospital (seen below). Emily’s strand begins with her nickname: Stitch. Christina felt this name was important to use because it is Emily’s feisty attitude that the doctors have continually commented will be one of her greatest assets on the difficult road ahead. The bulk of her strand is comprised of small beads representing her treatment: white for chemotherapy, black for any needle pokes, red for blood transfusions, green for fevers or neutropenia, yellow for a night in the hospital, and so on. She also has a few special beads. The large black bumpy bead (right after her name) represents her mobility challenge. 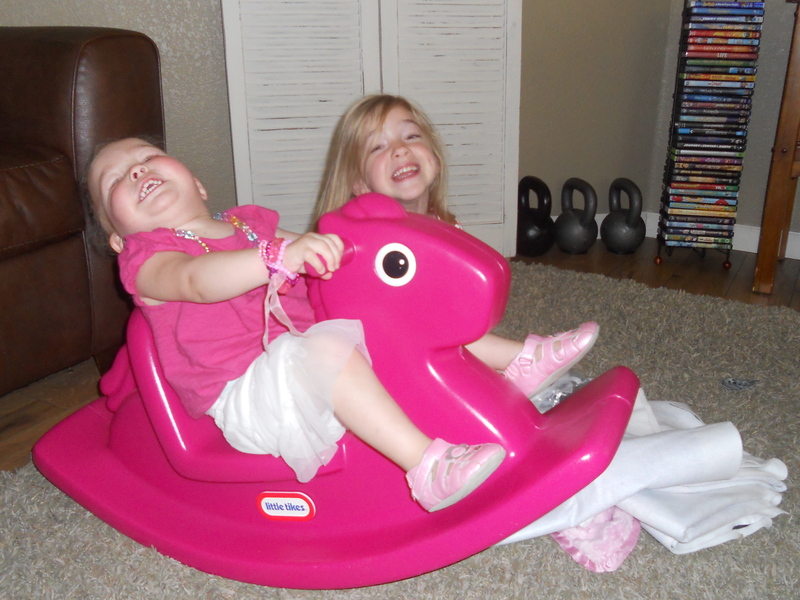 Emily’s refusal to walk was one of the first indications that something was not right. After more than a month off her feet, it is likely Emily will have to re-learn how to walk at some point in the future when her strength and spirit recover. The blue star represents surgery for her bone marrow biopsy. The music note was given to her for participating in music therapy at the hospital. The rainbow bead is given for Care Team Visits with the Child Life Specialist. The silver bumpy bead represents a medication challenge – in this case, given after Mom and Aunt Elisabeth were unable to get Emily to take medications the first time she was released home. Wingman is someone who flies beside you. It is someone who protects you. It’s someone who watches your back when you feel as if you are flying solo. I want you to know that you are not alone, and that you’ve got me as your Wingman. That is what this bead means. Keep the Wingman Bead close, and know that your own strength runs very, very deep. After the Wingman bead, comes a large blue & green glass bead that holds a very special significance for the family. This bead was given as a part of a program in which individuals wear the beads during marathons and races before donating them to the children as symbols of the strength and endurance needed to fight serious illness. 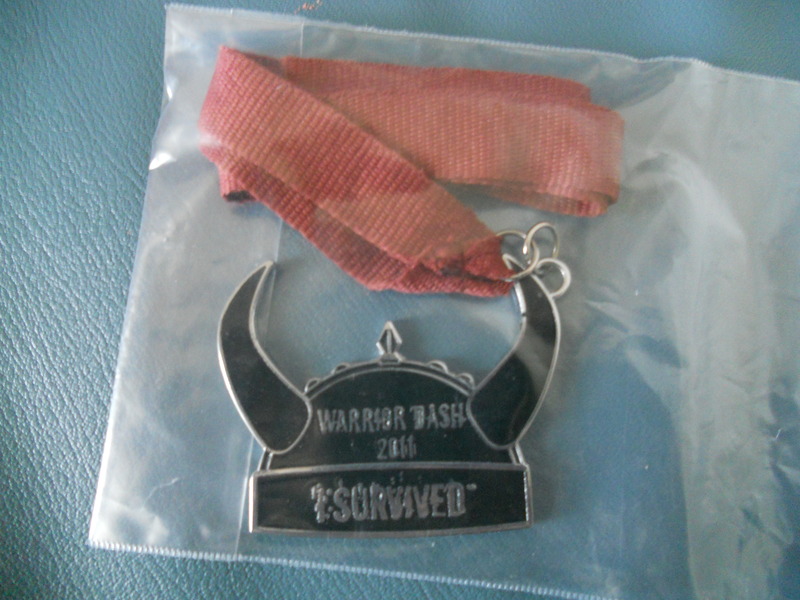 Emily’s glass bead was worn by a man in Oklahoma, a cancer survivor himself, who ran a race called the Warrior Dash. 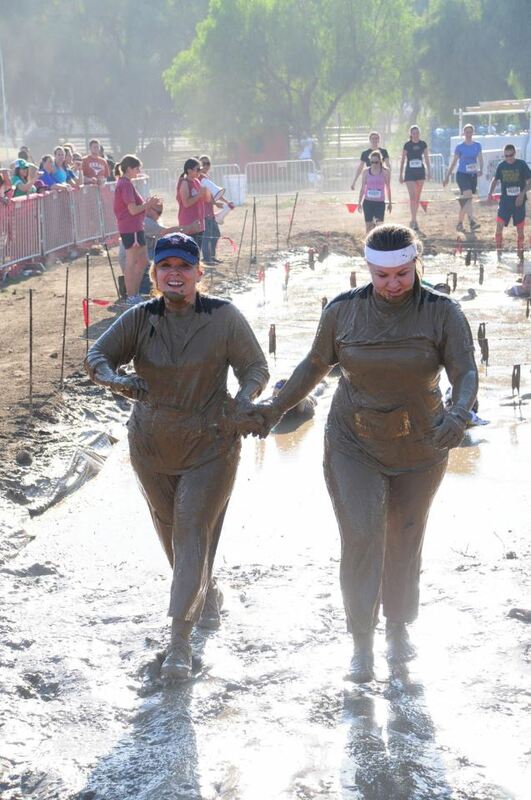 The Warrior Dash is a crazy 3-mile run that includes hurdles, obstacles, and physical challenges that would frighten the toughest Marine! 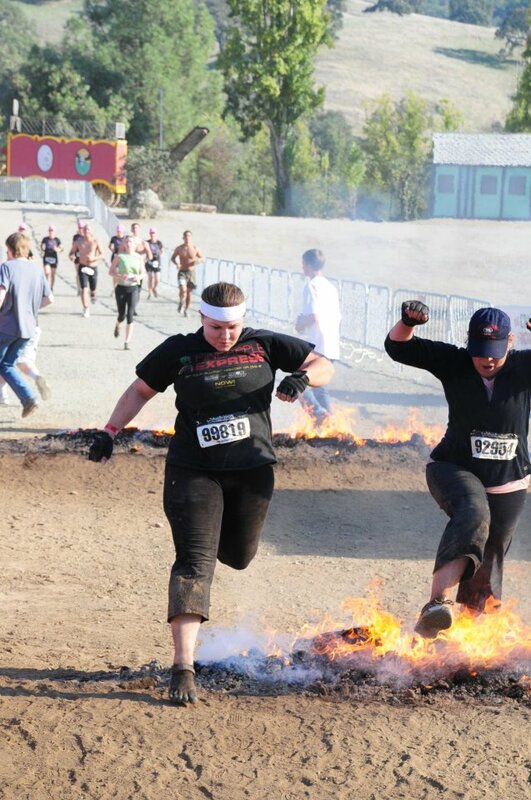 Runners climb vertical walls, crawl through mud pits, and leap over fire! Emily’s bead wearer chose this event because it was the hardest event he had heard of and therefore the best way to honor the courage she’s shown in her battle. The honor this man gave, not just by wearing a bead, but by his thoughtfulness and encouragement to a child he’s never met, are incredibly uplifting. And part of what makes this story even more incredible and personal, is that Emily’s Grammie Genie and Aunt Gaby ran the very same event in Holister, CA this past fall. Just a month apart, and across the country, three Warriors made brave journeys that now stand as incredible symbols of the courage and strength of Emily Love as she becomes a real life “Warrior”. Emily’s strand of beads has already grown beyond what’s seen in the picture above. 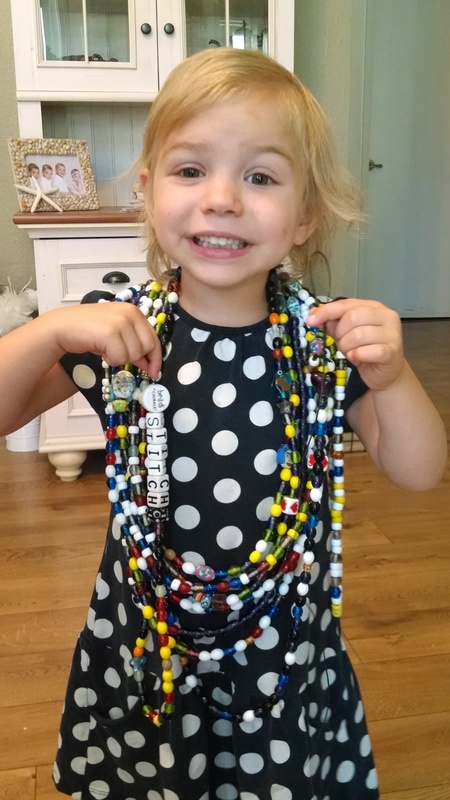 Every day, she undergoes medical milestones that will be recorded with beads to symbolize the immense courage she shows in the face of her pain and discomfort. In the months ahead, Emily’s beads will be reminders that she can overcome any test or procedure because she has already survived so much. And someday, years in the future, Emily will have this strand of beads as a tool to tell the story of her courage in her fight against Leukemia.